The jurisdiction of this blog just expanded. I know many Reformed blogs have always posted on personal interests that lay outside the realm of Reformed theology, but I had rarely, or never done so myself. This changes today. Facebook friends of mine have become painfully aware of the fact that I have, in the past year, reverted to where I left off at about age nineteen, in my interest in comic books and Star Wars. I have been calling 2015 “The Year of Star Wars” since the announcement that George Lucas had decided to sell Lucasfilm to Disney and the joint announcement that Disney’s newly acquired company would begin a new trilogy of Star Wars feature films, along with a handful of spin-off films. There is also talk of a live-action Netflix series in the works (see this for the new canon). But, most significantly for myself, is the fact that now that both Marvel Comics and Lucasfilm are under the Disney umbrella, the twenty-plus year run of Dark Horse brand Star Wars comics is coming to an end, and Lucasfilm’s new sister company will resume publishing Star Wars comics, which they originally did since the 1977 release of the ground-breaking original Star Wars film when I was six years old, which somehow managed to wrap its tentacles around my brain. Some of you may be aware that yesterday, the long-awaited official theatrical poster of Star Wars, Episode VII: The Force Awakens was released, as a fore-runner to the fashionably late debut of the first full trailer for the film, to be aired during half-time on Monday Night Football on ESPN tonight. But, thank the Maker for DVR technology! I needn’t sit through a game I’m not interested in to catch the trailer. I’ll record it, watch my normal shows, probably check in on the progress of the game in order to catch it live, then back to my preferred viewing. Then I’ll protect it in my DVR so I can re-watch it as often as I like. The infrequency of my blogging on theological issues may largely be explained by the fact that since 2010, when my family finally joined an Orthodox Presbyterian Church, my formerly frustrated need for sound theology began being met, and my compulsion to seek interaction with others who believe as I do–few and far between as we often find ourselves–has found relief in my enjoyment of weekly ministry of the ordinary means of grace at Mid-Cities Presbyterian Church in Bedford, Texas. In 2013, we moved from our original rental facility, the Airport Area YMCA to a small building on 1.6 acres on Brown Trail in Bedford. With that move, the deacon in charge of the library asked me to take over directorship of our small collection of books, and also requested that I come up with a way to facilitate online discussion of our books among our library patrons. This lead to the launch of my second blog, the MCOPC Library Blog. I have been posting our titles on this blog, which will serve as an online card catalog in the hopes that one day I will learn how to provoke a church full of ordinary people who are not already avid bloggers to open up and review, comment, raise questions and engage in discussion or debate on our humble blog with other library patrons. This strikes me as a daunting task. But perhaps with time, more of that will begin to happen. I will begin reblogging those posts here as well, if only to increase the frequency of Reformed-content blogging. I also have intentions to resume my devotional series I started in 2006, which broke down with the increased difficulty in pairing questions and answers from the Westminster Shorter Catechism on the Ten Commandments with hymns featuring related content from the Trinity Hymnal. But I have a source which will assist me in that, my pastor has managed to do so in his Sunday evening service teaching ministry on the catechism, and has invited me to benefit from his work in that area, for which I am grateful. 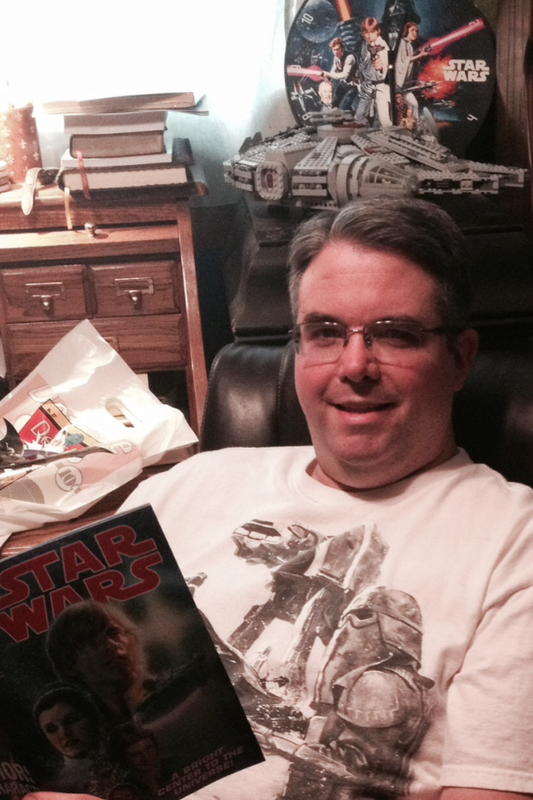 But in the meantime, I hope you will enjoy geeking out with me about Star Wars and Marvel Comics from time to time. Let me know what you think about the Force Awakens poster, speculate about why you think Luke is missing, and check back here for more forty-something fanboy misadventures.